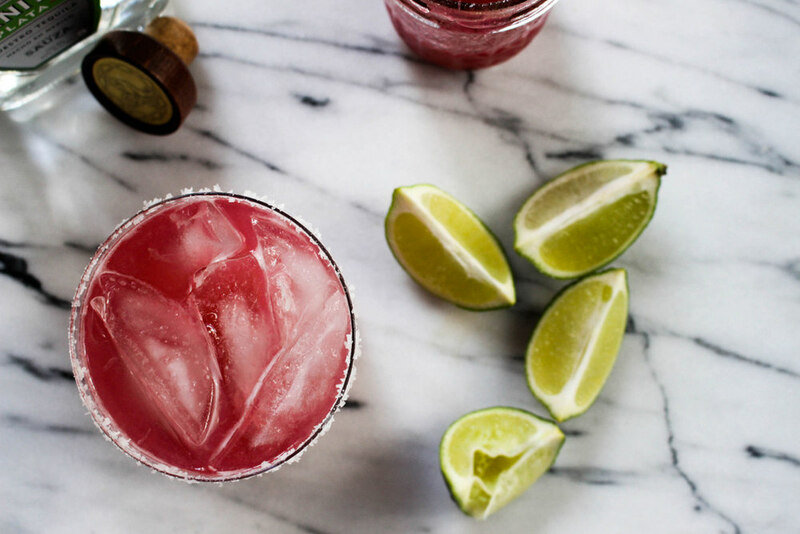 Oh, did you think that I was going to stop making margarita recipes? You clearly don't know me. Because there are so many great concoctions still to come. Last week we had one of my favorites, a Cucumber Margarita, or how about the traditional version, with my go-to classic version, that one is always good! But today, today I give you one that is so good, you won't even believe how easy it is. Rhubarb Margarita. Yes, that's right! Rhubarb is not just for pies, crisps or cobblers. It makes the perfect summer time margarita. So make a batch of rhubarb simple syrup and try this drink. And hey, if you have leftovers make the kids a rhubarb soda float! They'll love you forever. Combine all ingredients in a medium sauce pan and bring to a boil. Lower heat to a simmer and cook for about 40 minutes, until the fruit is soft. Using a heatproof bowl, place fine mesh strainer over top and ladle rhubarb and liquid into the strainer, pressing on the solids with the back of a spoon to release more juice. Once you feel you have got all of the juice, a little over a 1/2 cup, set the syrup aside. *Note, I like to keep the leftover rhubarb and serve over toast, yogurt or ice cream. Fill jar with lots of ice, add rhubarb simple syrup, tequila, and lime juice. Put lid on and shake, shake, shake.